Federal appeals court rules wearing unearned military medals is free speech. 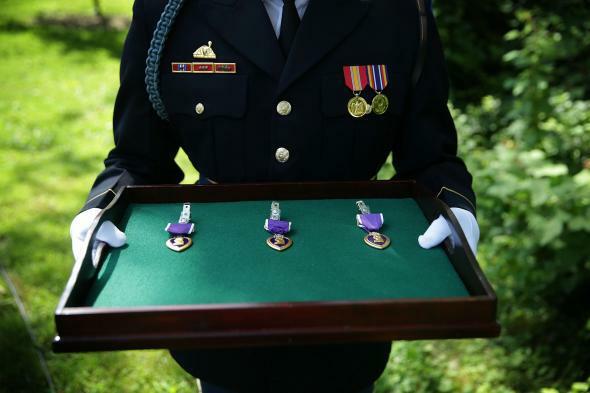 A U.S. Army honor guard holds a tray with three Purple Heart medals during a Purple Heart ceremony June 9, 2015 in Mount Vernon, Virginia. The case centered on Elven Joe Swisher, a military veteran who served in the Marine Corps from 1954 to 1957. Swisher testified in a 2005 trial wearing a Purple Heart he had not earned on the witness stand, a violation of the Stolen Valor Act signed into law by President George W. Bush in 2006. The Supreme Court in 2012 struck down the portion of the law that made it illegal to lie about military accomplishments on First Amendment grounds and the appeals court found the same constitutional problems with its prohibition on wearing unearned medals. [The court] cited the U.S. Supreme Court’s ruling in 2012 striking down a related law that prohibited lying about winning a military honor. That 5-4 decision said that the law punished speech without requiring proof of intent to defraud and that the government had other ways of protecting the public from deception — for example, an easily accessible database of legitimate medal winners. A year after that ruling, Congress enacted a revised law that makes it a crime to lie about military honors, but only if the liar intended to profit or defraud someone. The new law does not punish someone solely for wearing an unearned medal. Dissenters from Monday’s ruling said falsely wearing medals is conduct, not speech, and is potentially more harmful than lying about them. Swisher has already served his one-year sentence for the false-medal charge and was appealing the case on free speech grounds.